(Japan; July 15, 2016) BONX, the Japanese company that is reimagining the art of communication, has announced their entry into the American market this Fall. 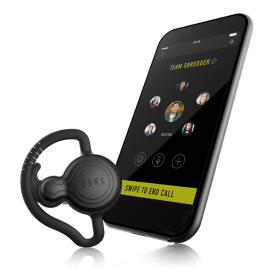 Launched late last year, BONX first product is, the BONX Grip, a Bluetooth connected earpiece driven by a custom smartphone app that lays claim to one of the most well-funded crowdfunding campaign ever in the Japanese market. BONX Grip comes in four colors and sells for a suggested retail price of $139. Consumers will be able to pre-order BONX Grip via a crowdfunding campaign that the company plans to launch soon on Indiegogo. A Bluetooth earpiece, BONX Grip connects to an original smartphone app to facilitate unique group conversation, which only transmits voice when a user speaks and is optimized for outdoor environment with unstable cellular reception. Dual microphones with multilayer wind and noise reduction technology ensure crystal-clear speech, and there is no distance limit, thanks to data transmission over standard cellular networks. BONX Grip is water and shock-resistant. It’s uniquely designed to stay put during rigorous outdoor activities, and maintains maximum comfort with a choice of three different sized earbuds.